The best part of the film is the staging of the actual “kill Bin Laden” mission, which encompasses the last third of the film. Done as a night raid, the atmosphere around each step of the military intervention is thick with intrigue. The night setting also washes any color from the proceedings – conducted through cinematographer Greig Fraser – which adds a tone of doom and mystery to a situation in which the outcome is already known. 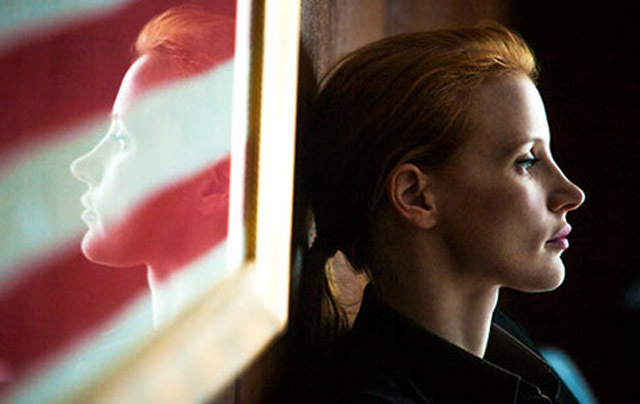 What doesn’t work, and almost hijacks the whole film, is the miscasting of Jessica Chastain as Maya. Not to dismiss her earnest performance as an obsessed CIA operative, but the film tactically misuses her low necklines, tight jeans, glossy red hair and white teeth as an actual agency representation. It becomes unbelievable, and hurts the absolute seriousness the film desires to be. The script – written by Mark Boal – doesn’t help her either, as she is put through a pool of emotions that are designed to take advantage of her gender vulnerability, to represent all our fears? Maybe if she had been de-glamorized a bit, it might have worked better, but it made the preliminaries to the actual mission somewhat disingenuous. Another problematic circumstance built into the film is the jingoism of the United States of America as the principle bearer of morality regarding Bin Laden. Nothing is shown to be overwrought in this pursuit, despite a draining of treasury, a formation of the “investigate-anyone” Homeland Security and a perpetuation of fear from the Bush administration (“mushroom cloud”) that defined the decade. There was a obvious celebration from the Navy Seal team once they got their man, but it felt like the locker room after a Super Bowl win, rather than a grim reminder of the horrors of legal murder. Now we’re comfortable? The film may give you a temporary feeling of USA superiority, but in the atmosphere outside the theater, the fight goes on. We need to keep challenging the notion that we can’t blame everything on the “enemy,” if we’re not willing to acknowledge our own fatalistic sins. Submitted by Zack Mandell (not verified) on January 2, 2013 - 3:03pm. I am really looking forward to getting out and seeing it. I hope it is as good as the movie reviews I have read.